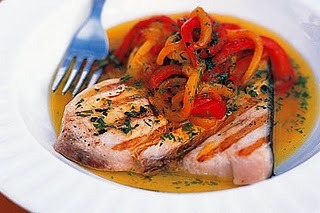 Swordfish is a very popular fish in Morocco and fillets are frequently available in major cities. In the Fez Medina swordfish is to be found in the souq at R'cif. 1. Place saffron threads in a bowl with two tablespoons of warm water and set aside for five minutes. 2. Place tomato, capsicum, coriander, cumin, chilli, garlic, oil, lemon juice and saffron and its soaking liquid in a pan. Heat gently through. 3. Preheat a chargrill or non-stick frying pan to high. Season the fish, brush with oil and fry for 1-2 minutes (the centre should remain rare). 4. Place on serving plates, add the herbs to the sauce and divide the sauce between the plates.